Sleeps 6 in comfort in 3 excellent size bedrooms. 1 king-double, plus 2 twin bedrooms. Modern villa with spacious open-plan living area and fully equipped kitchen. Fabulous 7m x 3.5m heated pool with swimming jet surrounded by large sunbathing patio in south-facing garden. Large dining terrace with gas BBQ. Beautiful views of surrounding vineyards and mountains in the distance. Many interesting places to visit. My husband David and I live in the UK and have a student rental property business, renting to students in Brighton and Guildford. Having spent most of our holidays in France with our children when they were younger we decided to buy our first home there in 2010 FR9145 and our second in 2014 FR22821. We pride ourselves on giving a superior service in our property business and have many great reviews from students and holiday makers alike. Modern shower room with large corner cubicle with overhead shower, basin in vanity unit and WC. En-suite to Bedroom 1 with large bespoke shower cubicle with overhead shower, basin and WC. Downstairs has a separate WC with basin. Spacious L-shaped open plan sitting/dining room with 2 double doors onto the large terrace. A large extendable dining table with 6 chairs. 37" TV with UK satellite receiver & DVD player. Also 5.1 surround sound with radio and IPod/MP3 player input. Electric hob and oven, fridge/freezer, microwave, and dishwasher. The kitchen is well equipped with all crockery, cutlery, glassware, pots, pans, serving dishes and cooking utensils etc. There are 3 golf courses within 15 miles. One in Beziers, one in Cap D'Agde and the other in Lamalou les Bains. Notes on accommodation: The property, pool, garden and everything in the house was new at the start of 2011 with modern, high qauality furnishings to provide very comfortable living with all mod cons. The pool is heated between mid-May and mid-October. Outside: The garden is south facing and the pool area is in sun all day and the raised terrace provides wonderful views of the sunset. The large raised terrace is tiled and has outdoor dining for 6 and a further seating area for 4 with cover for shade. A large gas BBQ is provided. The pool area is paved with sun loungers for 6 plus 2 large parasols and the pool has the required safety cover. The pool is delightful and has a swimming jet for those who want serious exercise, or just have fun! The pool is heated between mid-May and mid-October. The step area has been designed to provide a seating area in the water. There is parking for 2 cars. Utility Room: Washing machine, ironing board, iron, vacuum cleaner, mop, bucket, broom etc. Security safe. Cleaning / Towels / Linen: All bed linen hand and bath towels are provided. This will be changed once a week and the villa will be cleaned on changeover. The pool is maintained on a twice weekly basis and heated between mid-May and mid-October. Other: Free unlimited WiFi available. Cot and high chair available on request. We stayed here in order to attend a party in the village. We found the villa to be in an excellent location, quiet, well equipped and a delightful pool area. We will return at a future date. This is the third time we have stayed in this property and it was yet again a lovely holiday experience. Much of our time was spent on the great outdoor area, with dining, relaxing, and enjoying the pool. The house is suitable for all ages, and our young grandsons love the lifestyle too. There are lovely walks through the vineyards from the doorstep and the village facilities are good. Children's play area, boules, and all weather multi purpose area for football, badminton, volleyball etc. It is a great place to recharge the batteries, whilst feeling very comfortable in the house. 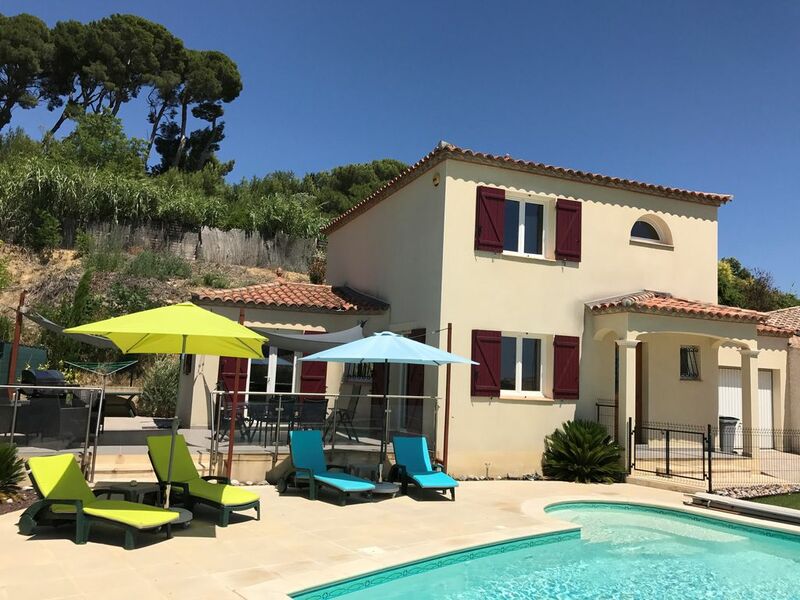 We stayed in this Villa in 2013 and loved it - but we wanted to try other areas of France . Having done so , we are now happy that this is the best accommodation and we love the village/area . Note , the terrace and pool are exceptional . Judith and David are a pleasure to deal with and we will be back here for our future holidays ! We (2 adults and 3 boys ages 11,13 & 14) stayed at the villa for 2 weeks and had a brilliant holiday. The villa is decked out to a very high standard and the owners provide all sorts of extras to make the stay easy. There really is everything you could ever need and more. The pool is a good size - the boys loved it. The patio is again equipped with loungers, chairs, tables, umbrellas - it is a lovely place to relax. Only 5 minutes drive away is Roujan where the big supermarket can be found. The villa is in a beautiful wine producing area yet in very easy driving distance to some great sights. We visited Carcasonne - fantastic, Beziers - a lovely city, Pezanas - great market town, Grotte des Demoiselles - amazing caves not to be missed. The coast is less than an hour away - Marseillan is beautiful. We would thoroughly recommend this villa and would love to go back again. The owners, Judith and David, have been very helpful and easy to deal with throughout the booking, holiday and afterwards. We had a great Summer holiday this year in Margon. The house is as described but better than expected. As others have said, the outside area is a highlight and was perfect for our 4 kids. The pool is ideal and our 6 year old went from being a tentative swimmer to a confident, happy swimmer over the fortnight. The interior suited us fine and the villa is very well equipped. Supermarket and boulangerie only 5 minutes away and, our personal favourite, Lac Salagou only a half hour drive. You have to go...great, safe open water swimming. We have great memories of all sitting at the outside table playing cards into the evening. Communication with the owners is first class and the flexible changeover days has made a huge difference to us. They are very helpful. How much did we like it? Well within three weeks of being home we booked up for next year. The lovely long sandy beaches of the mediterranean are about 30 mins away. With Vias, Portiragnes, Serignan and Valras Plage probably being the closest. The nearest airport is Beziers being 25-30mins away. Other nearby airports include Montpellier, Perpignan and Carcasonne all being about an hour from Margon. The TGV from Paris stops at Montpellier, Agde and Beziers. By car is easy and motorway all the way either via Lyon or the more scenic and mountainous route down through the Volcans, Cevennes etc and over the famous Millau Viaduct. Although there is a bus service into Margon we would highly recommend a car. It is a 5 min stroll into the 2 local reataurants. The nearest village with a good selection of local shops is Roujan which is 1.5 miles away, and now has a large SuperU. The beautiful historic market town of Pezenas is 7 miles away with its narrow streets, many restaurants and bars, craft shops, boutiques, cafes, etc. It also has a fantastc Saturday market. Pezenas also has a variety of supermarkets, diy stores, garages, etc. The village of Margon has a most beautiful 13th century chateau. The grounds of which are open to the public on certain days and are well worth a visit (guided tour included). The village has 2 restaurants open lunchtime and evening The Belle Lurette for informal dining and The Auberge de Chateau for more formal dining. The locale is famous for its wine and there are many Domaines where local wine can be tasted and bought. The local Chateau de Margon wine is available through Domaine D'Arjolle in Pouzolles which is a nearby village. The area is perfect for cycling as the scenery is beautiful with its vineyards and chateaux and there are many lanes off the beaten track to explore. The Canal du Midi is nearby and is also well worth a cycle/drive along as the there are many very picturesque villages to explore along the route. The stunning scenery of Lac Salagou about 25 mins away is well worth a visit. It is popular for swimming, sailing and windsurfing also for walking, mountain biking and fishing. There is also kayaking available on the River Orb. Carcasonne and Montpellier are both about 1 hr away and well worth visiting. Montpellier is the place if you want serious shopping. Carcasonne is a UNESCO World Heritage Site. Booking Notes: Please contact owner. Please also see our other property in Margon FR22821 Changeover Day: Flexible. Please arrive after 16.00 and depart by 10.00. Notes on prices: Available for flexible periods on a day rate, at certain times, plus cleaning charges.